Buy PoiZen a Coffee. 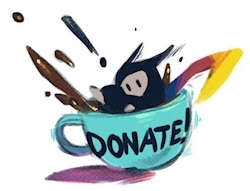 ko-fi.com/poizen - Ko-fi ❤️ Where creators get paid by fans, with a 'Buy Me a Coffee' button. PoiZen is bringing freelance creators and their supporters together with streamlined tools. With the site designed for creators, by creators, we will be bringing the community the resources we've needed for a long time. If you haven't already find out more at https://poizen.me/ From all of us in the PoiZen Squad, Create Well! Secured Payments. Support goes to PoiZen's account. Upgrade PoiZen to a yearly Gold Membership with a one-time payment.